"Bringing the Healer Back to Every Family"
Dr. Maka'ala Yates D.C., is a Kanaka Maoli (Hawaiian Ancestry) who specializes in Hawaiian medicine. His studies began at the age of 6. He has been teaching Hawaiian medicine and practices for 35 years. He is the founder of Mana Lomi®.and Indigenous Botanicals. Maka’ala received the Kaonohi Award in 2005 for his excellence in Hawaiian medicine and community support. 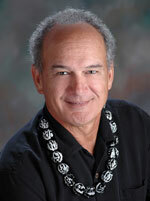 He is author of "Na'auao Ola Hawaii:Hawaiian Practices and Principles of Being Well." The Mana Lomi® technique is available for all those who are open to learn the traditional, Hawaiian ways of healing. We welcome all backgrounds, beliefs and nationalities, and encourage our connection by eliminating separation.